Hotel in New York City. Co-spon- sored by the Marine Technology So- ciety and the Maritime Association of the Port of New York, the meet- ings are expected to attract marine salvage experts from the world's principal maritime nations and, for the first time, will have a limited number of exhibits. Opening with the keynote address by the Honorable C.P. Srivas- tava, Secretary General of the In- ternational Maritime Organization, the 2^-day symposium will consist of five sessions dealing with the fol- lowing topics: challenges to the sal- vage industry, contingency planning in salvage, the specialist's role in salvage, topical issues in salvage, and salvage on the coast of China. Luncheon speakers will be Adm.
Dr. Francesco Berlingieri, pres- ident of Comite Maritime Interna- tionale. Efficient, effective, and profitable marine salvage operations share one key element—state-of-the-art knowledge of the complex factors involved. 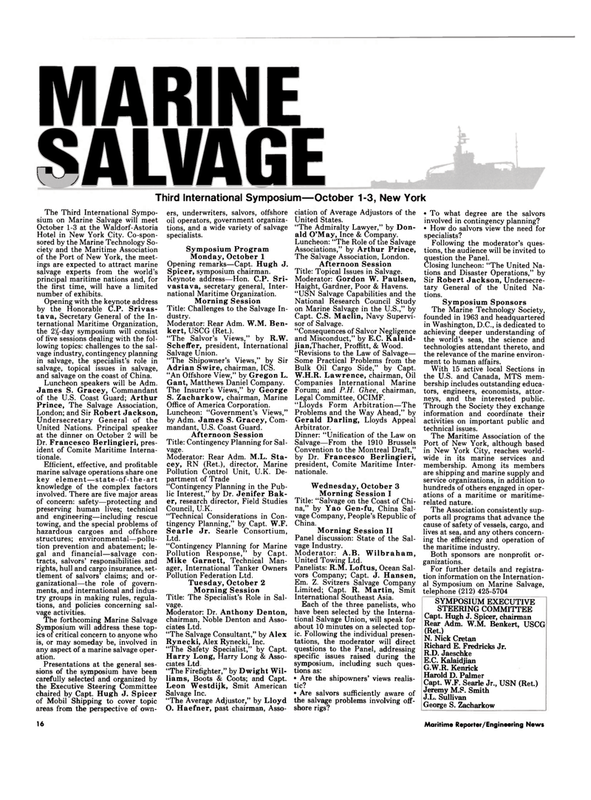 There are five major areas of concern: safety—protecting and preserving human lives; technical and engineering—including rescue towing, and the special problems of hazardous cargoes and offshore structures; environmental—pollu- tion prevention and abatement; le- gal and financial—salvage con- tracts, salvors' responsibilities and rights, hull and cargo insurance, set- tlement of salvors' claims; and or- ganizational—the role of govern- ments, and international and indus- try groups in making rules, regula- tions, and policies concerning sal- vage activities. Symposium will address these top- ics of critical concern to anyone who is, or may someday be, involved in any aspect of a marine salvage oper- ation. Presentations at the general ses- sions of the symposium have been carefully selected and organized by the Executive Steering Committee chaired by Capt. Hugh J. Spicer of Mobil Shipping to cover topic areas from the perspective of own- ers, underwriters, salvors, offshore oil operators, government organiza- tions, and a wide variety of salvage specialists. Keynote address—Hon. C.P. Sri- vastava, secretary general, Inter- national Maritime Organization. Title: Challenges to the Salvage In- dustry. Moderator: Rear Adm. W.M. Ben- kert, USCG (Ret.). "The Salvor's Views," by R.W. Adrian Swire, chairman, ICS. "An Offshore View," by Gregon L.
Luncheon: "Government's Views," by Adm. James S. Gracey, Com- mandant, U.S. Coast Guard. Title: Contingency Planning for Sal- vage. Council, U.K. "Technical Considerations in Con- tingency Planning," by Capt. W.F. Title: The Specialist's Role in Sal- vage. Rynecki, Alex Rynecki, Inc. "The Safety Specialist," by Capt. Harry Long, Harry Long & Asso- ciates Ltd "The Firefighter," by Dwight Wil- liams, Boots & Coots; and Capt. United States. "The Admiralty Lawyer," by Don- ald O'May, Ince & Company. Title: Topical Issues in Salvage. Bulk Oil Cargo Side," by Capt. Convention to the Montreal Draft," by Dr. Francesco Berlingieri, president, Comite Maritime Inter- nationale. Panel discussion: State of the Sal- vage Industry. Each of the three panelists, who have been selected by the Interna- tional Salvage Union, will speak for about 10 minutes on a selected top- ic. Following the individual presen- tations, the moderator will direct questions to the Panel, addressing specific issues raised during the symposium, including such ques- tions as: • Are the shipowners' views realis- tic? • Are salvors sufficiently aware of the salvage problems involving off- shore rigs? • To what degree are the salvors involved in contingency planning? • How do salvors view the need for specialists? Following the moderator's ques- tions, the audience will be invited to question the Panel. Sir Robert Jackson, Undersecre- tary General of the United Na- tions. The Marine Technology Society, founded in 1963 and headquartered in Washington, D.C., is dedicated to achieving deeper understanding of the world's seas, the science and technologies attendant thereto, and the relevance of the marine environ- ment to human affairs. With 15 active local Sections in the U.S. and Canada, MTS mem- bership includes outstanding educa- tors, engineers, economists, attor- neys, and the interested public. Through the Society they exchange information and coordinate their activities on important public and technical issues. Port of New York, although based in New York City, reaches world- wide in its marine services and membership. Among its members are shipping and marine supply and service organizations, in addition to hundreds of others engaged in oper- ations of a maritime or maritime- related nature. The Association consistently sup- ports all programs that advance the cause of safety of vessels, cargo, and lives at sea, and any others concern- ing the efficiency and operation of the maritime industry. Both sponsors are nonprofit or- ganizations.